Written by Testament, directed by Dawn Walton. Thomas, Matthew, and Richard walk. They are three Black men who walk, talk and narrate their existence in the present, the past, and the future. As they travel into the safe spaces of the countryside they question where they are from, and where they belong. This gripping piece takes the audience on a journey that is as unpredictable as the surface of the Yorkshire moors. The audience clamber awkwardly into sections of the personal lives of the three men as seen through their own conversations and everyday experiences of relationships, politics and families. Each compelling step they take is a mark of their physicality and being, being alive and being part of the country whose backbone they trek across. When they encounter a lone young woman (Ayeesha) in the dense hill-top fog they are also forced to confront their own aged masculine prejudices, but they still join forces with her to descend the hill together. As an enlarged group they surprise themselves with continued personal revelations whilst celebrating their own blackness and sense of belonging in the landscape. All the walkers are enveloped in an actual and metaphorical foggy existence where, as noted by W.E.B. Du Bois, they experience a ‘double consciousness’ of identity as being both British and black. Identity and belonging are the central themes of this piece; the black men (and woman) walking the moors deliver emotionally charged performances generously peppered with humour while challenging perspectives of reality about what parts of themselves they have to leave behind in order to be accepted in British society. The actors leave the audience with plenty of food for thought as they discourse on matters from John Blanke, 16th century trumpeter in the courts of Henry VII and VIII, to the chicken shop encounter of the contemporary hijab-wearing, metal-worker rapper Ayeesha: all are black, and all belong in England – their home for centuries. The sense of moving across vast areas is beautifully portrayed on the stage by the four actors’ use of mime and music. This is paralleled with the immense historical span that is covered in the conversations. 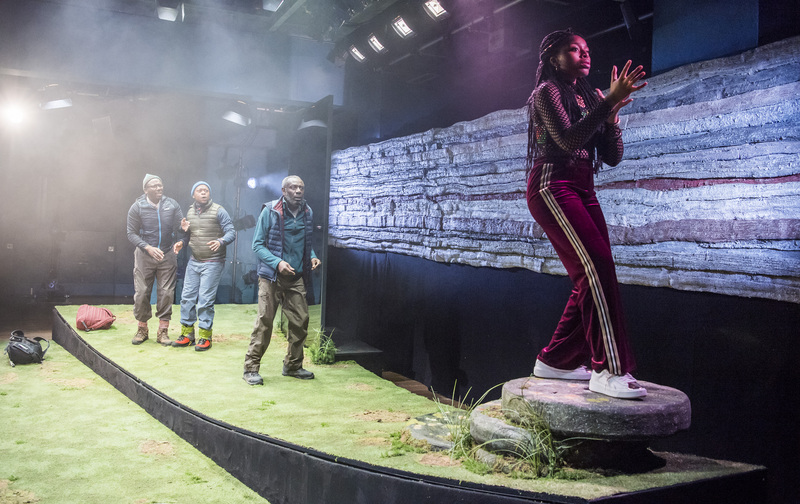 The actors’ – Thomas (Tyrone Higgins), Matthew (Trevor Laird), Richard (Tonderai Munyev), and Dorcas Sebuyange (Ayeesha) – performances elicited a well deserved double standing ovation. The booklet accompanying the play notes that it is dedicated to the Black Men’s Walking Group, the dedication can justly be extended to include all the Black people in the UK: we walk, we walk, we walk! The hype about this play is justified.